We describe the development and characterization of a new cell line, designated Xl1, derived from vertebra and long bones of Xenopus laevis. These cells can mineralize their extracellular matrix upon addition of an inorganic phosphate donor and vitamin C, as characterized by von Kossa staining. In addition they express genes such as matrix gla protein (mgp), alkaline phosphatase, type II collagen, and retinoic acid receptors, representing a valuable tool to analyze expression and regulation of Xenopus cartilage-associated genes. 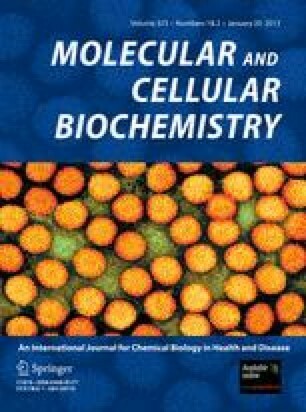 Continuous treatment with retinoic acid (RA) inhibited mineralization, alkaline phosphatase expression and its activity, suggesting that RA is a potential negative regulator of Xl1 cell differentiation. These cells are receptive to efficient transfer of DNA using conventional methods including calcium phosphate, liposome-mediated transfer or electroporation and were found to express basal levels of mgp at least 50-fold higher than the routinely used Xenopus A6 cell line, as seen by transcription assays with the distal X. laevis mgp promoter. Being the first amphibian cell line derived from bone tissue, the Xl1 culture provides an excellent in vitro tool for functional promoter studies, being suitable, among other uses, for identifying promoter elements mediating cartilage-expressed genes as shown here for mgp. Natércia Conceição and Michael Viegas contributed equally to this work. The online version of this article (doi: 10.1007/s11010-012-1473-x) contains supplementary material, which is available to authorized users. This work was partially funded by CCMAR and grants POCI/BIABCM/58677/2004 (POCI 2010 and FEDER funding) from the Portuguese Science and Technology Foundation (FCT). NC is supported by a post-doctoral grant from FCT (SFRH/BPD/48206/2008). MV was funded by Instituto do Emprego e Formação Profissional (IEFP) and CCMAR (fellowship ref#72/EP/2008). We are grateful to Dr. Jorge Pinto for his help in the generation of the Xenopus Xl1 cells.